JCPenney is participating in FREE SHIPPING DAY with guaranteed delivery by Christmas. Use promo code SHIPDAY to get your FREE Shipping today, December 18th only! Plus keep reading to find out how to save $10/$25 or 30% off $100+! Save $10 off a $25 purchase at JCPenney through December 19th. Just print this coupon for $10 off a $25 purchase of select original, regular, sale and clearance-priced apparel, shoes, accessories, fine jewelry, home, furniture, mattresses, custom blinds & shades – valid in-store OR shop online with the code NOWSAV at checkout to get $10 off $25. Buying more than that? You can also save 25% off any order with promo code FUNSHOP. (*NOTE the $10/$25 coupon is a better deal if you’re spending under $40. If it goes over $40, you’ll want to use FUNSHOP). Spending over $100? Then code FUNSHOP will take off 30%! Exclusions do apply so read the fine print. Procrastinators Rejoice! 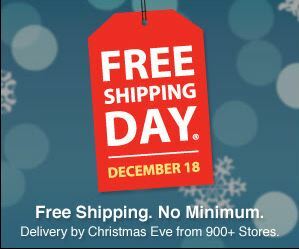 The 8th Annual Free Shipping Day is Friday, December 18. More than 900 stores including Walmart, Target and Harry & David are offering FREE SHIPPING ON ALL ORDERS with delivery by Christmas Eve. See all participating stores and get the coupon codes at the Official Free Shipping Day website: FreeShippingDay.com. Also, tune in here where I will be posting free shipping deals and codes as I come across them! Don’t forget you can find all the latest Christmas Shopping Deals by clicking here or on the Christmas Deals button anytime you visit! Don’t know what to get? Check out the Holiday Gift Guide for ideas! Previous post: Target: TWO 50% off Toys TODAY only! UNO Retro and Frozen Pocket Pops! Next post: Walmart: FREE Shipping, No Minimum All Day Long!